I hope everyone had a fun and safe start to 2011. I'm so excited for this year--I have a sneaking suspicion its going to be a great one! To start off the new year, I wanted to wear something festive that wasn't traditional NYE glitter and sequins. I ended up going with a Jackson Pollock-inspired look--what could be more spirited than action painting? I had Pollock in mind when I bought this dress. Set against the backdrop of the barren trees, I though the setting evoked the beautifully haphazard layering of the paintings. 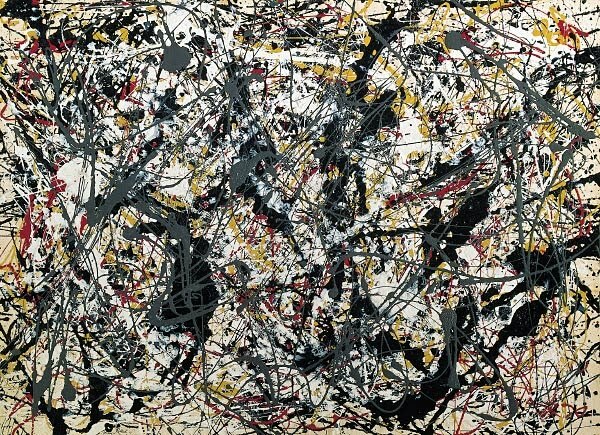 The beauty of Pollock's action paintings comes from the many layers of dripped paint and the open composition. The way the paint was applied to the canvas has a rhythmic quality that could not be achieved by easel painting. 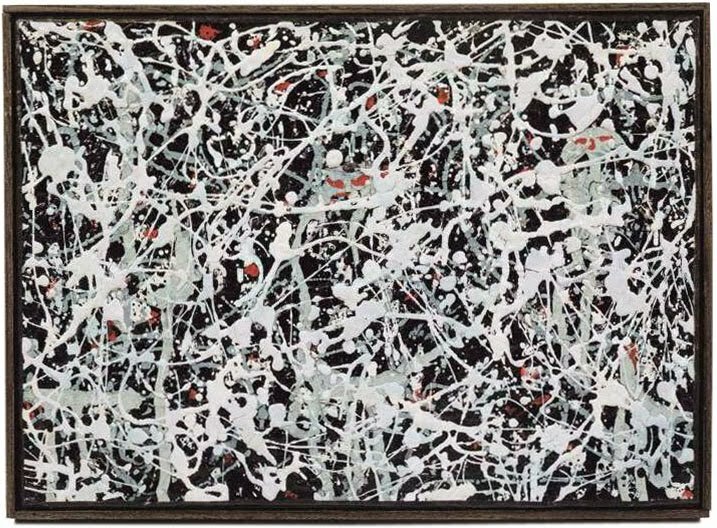 Pollock's method of flinging paint onto a horizontal canvas changed painting forever (and signified the highest level of art to critics like Clement Greenberg). 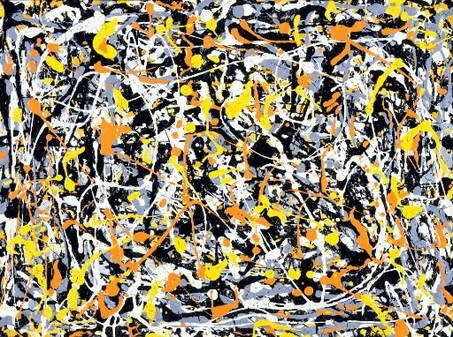 Argued to be the earliest action painter, Pollock's notorious hard living cut his career short, but not before he created some of the most well-known and recognizable artworks of the 20th century. I've been inspired by the Abstract Expressionists a lot recently, possibly due to the current blockbuster AbEx New York exhibition at the MoMA. AbEx not only inspired my New Year's Eve outfit, but also my New Year's Resolution: to let go and live my life like a giant action painting--making what could seem like accidental drips or unplanned instances into a multilayered masterpiece. I'm wearing an H&M dress, DKNY leather motorcycle jacket, Madewell necklace, Dannijo ring, and Christian Siriano x Payless "talon" shoes. I love your dress and your resolution - I think I need to adopt that for myself. Hope 2011 is amazing, happy new year! Spectacular first post of the year, Ariel. The dress and the shoes complement the paintings beautifully, and great photos - I particularly like the first in full light and the last with you in the road surrounded by snow and the dusky sky. Great selection of paintings, I especially like the layers of color in the first. First learned of Pollock watching a movie where the main character said "It was like being in a Jackson Pollock painting - things were exploding!" and since he has always been a favorite. Thank you for posting and Happy New Year! That is one amazing dress!!!! So incredible!! I love your new years resolution! lovely post dear, you very beautiful)))GREAT BLOG!!! Happy New Year! I love the lace detail on the back of that dress - it really makes it even more special (though the JP print is a knock out). Oh my gosh, check out those heels... damn girl, those are HOT!!! precioso vestido y espectaculares zapatos, muuy guapa!!! Beautiful dress (love the lace back)! And the shoes are even more gorgeous! Love that you based it on those paintings! Sooo original. My nail polish color is Essie lollipop with a glitter nail polish as a top coat! Hope you have a great New Year!! And HOW IS YOUR HAIR SO FANTASTIC?!?!?!!?! Every picture. Without fail. Your hair. Is. Amazing. I love your dress it's so you !!!! And the art that went with it is amazing!!!! love the print and the heels? YOURE KILLING ME! I love the curve of the actual heel....damn! I need that in my life!! That dress rocks!! You look great! I love Pollock's art and this dress represents its perfectly. I love that its not the typical glitz and glamor of new years. You look amazing, as well. Your outfit looks designer head to toe. Couldn't beleive that is an H&M dress and THOSE ARE PAYLESS SHOES! Are they new? I might run and get a pair. Love them. You look great. 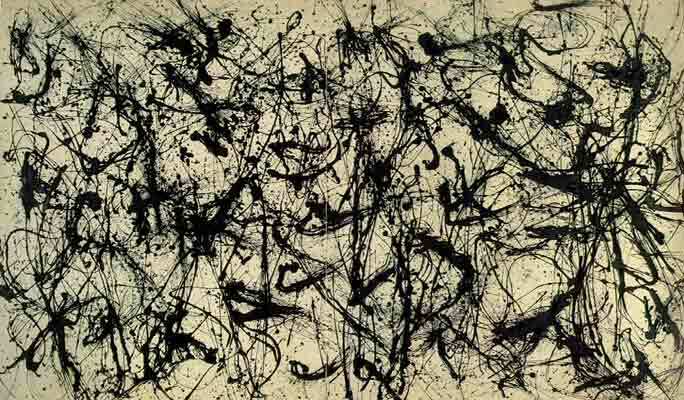 Pollock is my favorite! Love your shoes. that dress and those shoes are so amazing!! are those from a recent christian siriano collection? Those shoes are crazy cool and I love the paint splatter-effect of the dress. Everytime I check out your blog and then see the artistic inspiration/reference I am just agog! It's so inspiring and cool! HMMMM first off, I just stumbled upon your blog and I'm hooooooked! The way you organize your posts is already very different that what I'm used to. I love that you're able to incorporate art into it, its like they're wearable art hah. secondly, you're gorgeous and I'm absolutely in love with this outfit. You're super brave for wearing such neon colors (and pulling it off flawlessly) and those shoes, AH those shoes make me swoooooon! I'm definitely a new follower (worshiper, etc etc) Happy 2011, hope you had a good NYE! gorgeous gorgeous!!!!!! !...i cant believe those shoes r from payless!!! Amazing dress!! The colours and prints are both fantastic. It's a perfect NYE dress. The shoes are stunning as well. please please please follow my blog and tell me what you think! Beautiful outfit, I love the print on your dress. You look stunning! That is a pretty dress match witht the right shoes. Maybe we can follow each other? Lovely maxi dress and I NEED those shoes! How long ago did you get those? heyyy...im amazed...the shoes,the dress,your looks,your beauty,the paintings,your enteyer blog...fabulous..the paintings r yours?? ?